Mario Tennis: Power Tour (also known as Mario Power Tennis in Europe and Australia, and as Mario Tennis Advance (マリオテニスアドバンス, Mario Tenisu Adobansu?)) in Japan) is the Game Boy Advance counterpart of Mario Power Tennis for the GameCube, and the final release for said handheld. It is very similar to Mario Tennis in gameplay and plot, though it has the addition of Power Shots. 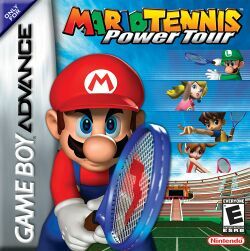 Though it is the counterpart of Mario Power Tennis, the two games cannot be connected in any way.